YMCA strives to offer quality programs and services that give children, youth and adults the opportunity to belong, grow, thrive and lead. The Don Wheaton YMCA responds to the growing needs of an ethnically and demographically diverse downtown Edmonton community. The project included the construction of a new YMCA community centre as well as a renovation of the existing Downtown YMCA, creating a unique two-campus model. The building design creates an open, publicly accessible zone along the street, providing access to the meeting and community spaces outside of the members-only controlled zones. The tight inner site required a careful stacking plan that minimizes the building footprint while allowing for the long span spaces of the pool and gyms to sit over the parkade below. 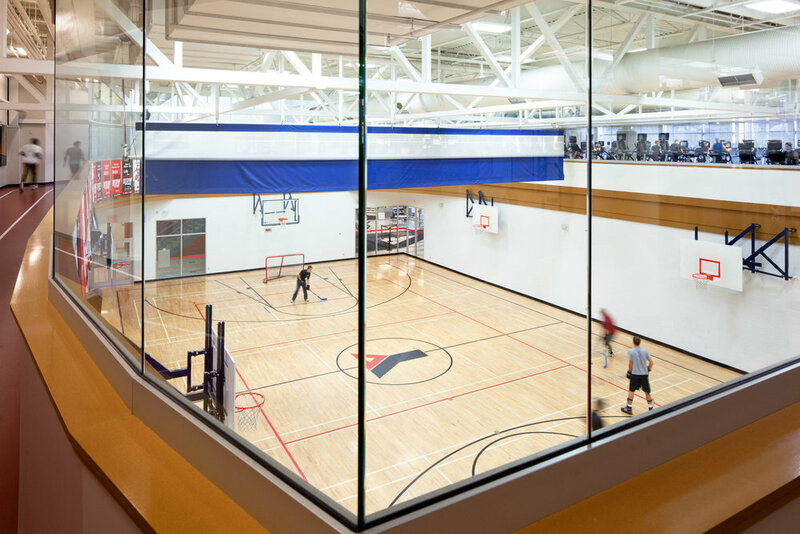 The YMCA provides a multitude of uses for the community including a 25 meter pool, hot tub, a full size gymnasium, 2 lane 100-m running track, climbing wall, public and individual work-out centers, and a multi-purpose space. A movable bottom in the pool allows for a variety of programs from seniors aquacise to tots swim lessons..